Coiled Cabs of Bend means every bit of it when they say they have “Clean Cabs, Cool Drivers, Fair Rates.” A full fleet of late model minivans is ready to deliver you to your destination in style and comfort, whether you need a ride to or from the Redmond Municipal Airport, a quick hop across town, or transportation for your wedding party to ensure everyone makes it to the church on time. 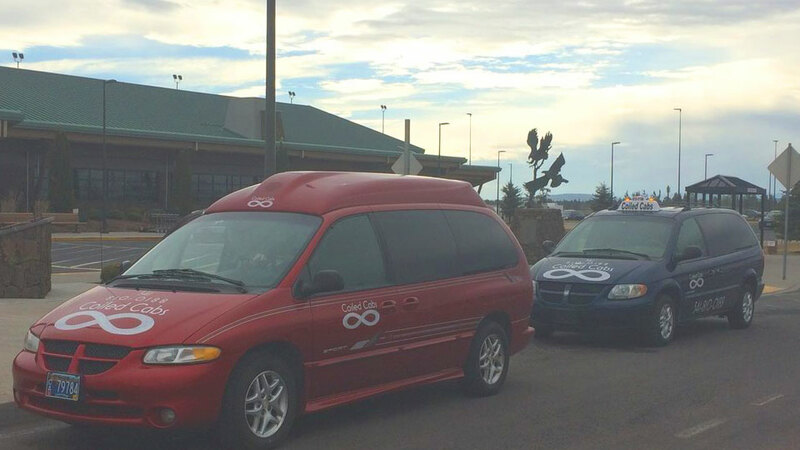 Coiled Cabs serves anyplace within a 150 mile radius of downtown Bend, including Sunriver, Redmond, Sisters, LaPine, Madras, and Prineville. Many of their fares, which are very competitive, are posted on the Coiled Cabs web site so you know in advance what your trip will cost. Now, about those cool drivers. There’s Matt, Coiled Cabs’ General Manager, who also happens to be an ordained minister. Cathy isn’t just a fantastic driver, she’s also a Process Coach and yoga instructor. If you want a driver who is also an award-winning songwriter, musician and comedian, Janelle is for you. Every Coiled Cab driver has a larger-than-life personality and each of them is ready to make your next ride a great experience. Just visit the Coiled Cabs web site to see who is on shift and schedule your ride directly.